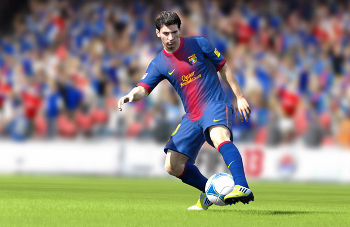 In FIFA 13, you may notice that EA have made it significantly more difficult to dribble through defenses consistently. This is because they've made skill moves a lot tougher to pull off, so don't expect to get past Pique with a nice Roulette every time. However, this is not to say that dribbling and skill moves have been made useless. You should still find opportunities to make the most of your dribbling skills. Read on to learn how! If you want to read more about some of the more advanced dribbling techniques and skill move usages, I highly recommend the Premier FIFA 13 Guide. It's an ebook, and it's not free, but along with great dribbling strategy content to make you look like those guys you see on YouTube, there's over 120 pages of seriously great content about everything FIFA 13. Want to read more about my decision before you make a decision? Read my full, unbiased review. Rather obviously, you should really only try to go on a long run when you have clear space in front of you. Gone are the days when you have any hope of just dribbling a foot away from a defender and thinking you still have a good chance. In FIFA 13, these defenders will simply stick out a foot and take the ball away from you every time regardless of whether or not your opponent was paying attention. Be especially ready to dribble with your wing players, who seem to have a lot of time to knock the ball in front of them with a big touch (explained below) and dribble down the line for a cross in FIFA 13. When you do have a lot of space in front of you to run into, you should take advantage of this by using the variety of big touches (executed by pushing the right stick in the desired direction any number of times) available in FIFA 13. The more times you push the stick forward, the larger your touch will be, but only use the multi-push big touches when you seriously have a LOT of space in front of you. Why should you use big touches? It's no secret that players move faster when they're not trying to handle the ball, so big touches may give you that competitive advantage as opposed to just dribbling/sprint-dribbling normally. When you're not sprinting into space, you'll be trying a much more difficult dribbling method: weaving back and forth. You definitely don't want to hold down the sprint trigger when you do this, because you'll mostly be confined to small dribbling spaces where small touches that stay close to your player work best. You just want to focus on moving to the side your defender won't be able to close down. This could mean you'll need to alternate the side you're approaching several times to get your defender off balance though. You may want to try controlled dribbling by holding down both triggers, but that's only if you have very little space to work with. As mentioned above, in FIFA 13 you have much less opportunity to mess around with skill moves. I'm not sure how, but EA definitely made it more difficult to actually pass a defender with skill moves in this year's FIFA. Still though, you can get good at using them when appropriate by simply practicing all the possible moves until you're used to performing them in any direction. You can use FIFA Encyclopedia's very own skill moves guide that will show you how to execute any possible skill move in the game, but it's mostly down to practice once you know how to do each move.